Subscribe to our mailinglist to stay involved on the development, receive special updates & get notified upon release! Countless generations ago, mankind unleashed a devastating plague upon itself. Technology was developed to the point of perfection, wars were won in days and fought with squadrons of giant, piloted mechs. Nations grew greedy, their thirst for land and power was never quenched and almost all of Earth's resources were diminished. Two major nations formed from the scraps of civilization, trying to achieve supreme dominance and control. After generations of war, desparate for a resolve and each side too arrogant for a peace treaty, they began to research a type of weapon that no amount of armour or firepower could save the fragile human body from. Wave after wave of biological weapons were released - thousands of species extinct, the air left unbreathable, cities vacant and what was left of humanity had to live underground in bunkers. Any trace of government slowly dissolved, morals tossed aside for resources, land and weaponry. Countless factions spawned as a result, humanity divided yet all living for the same purpose - to survive. Stuck in a perpetual war, will mankind exterminate themselves or find peace? You decide. Antraxx is a massively multiplayer mech shooter with a heavy emphasis on teamwork and replayability with completely customizable mechs and zones. Boasting multiple game modes and in-depth faction politics and economy systems, allowing you to play the game how you wish. The goal is to create a next-generation isometric game with a completely 3D engine rendering hand-drawn pixel art with dynamic lighting, shadows, positional audio and a refined control scheme. You are also able to create your own zones to share and battle in, providing near limitless sandbox gameplay. 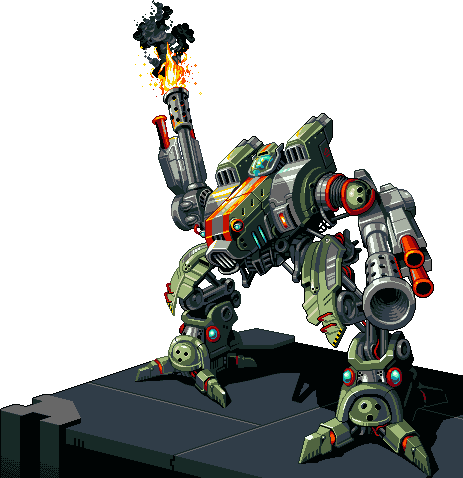 Collect parts and weapons to outfit your own giant mecha. Once you've crafted your own custom masterpiece, test out its mettle by dropping into one of the many dangerous conflict zones in the Antraxx world. It is here where you will get to test your might against other pilots. Acquire your own land in one of the many wastelands of the world in order to grow your own faction and cement your power. Special additions such as jetpacks, rocket launchers, lasers, teleportation, and cloaking devices allow for you to select your own unique playing style. There are various game modes present in the game, alongside the opportunity for endless creativity with our map creation tools. Join in player-hosted public events, giveaways, and battles. Charge and fire your lasers for a big impact, fire cluster missiles from great distances or get up close and personal with a heavy machine gun. There are countless ways to achieve peace in the never ending war known as Antraxx. There is a heavy emphasis on co-operative gameplay between your faction members and allies. No matter how powerful, one lone mech cannot withstand the might of an entire army. There is strength to be found in numbers. Join an existing faction, or if you wish you can even start your own and build a loyal following of friends and comrades-in-arms. Silver tongue? Every pilot has the opportunity to use the chaotic politics and economy of the world to their advantage and earn riches, power, land and mechs through diplomacy alone. Remember though, the taller they are, the harder they fall. With tight, responsive controls, you can pilot your own giant mech to either aid or destroy your fellow pilots. Inspired by classic arcade games, each battle is full of high adrenaline, explosive action. Antraxx will immerse you in a detailed, 1980's themed post-apocalyptic world. It is up to you to dominate the battlefields with only your guns and armored mech to your name. Players will fight for the control of special booster points on the map which will allow them to restore energy, health, or even grant them special powers such as invisibility. Each map has its own individual mechanics which must be learned and mastered in order to provide a fresh but familiar experience every time. No one mech is alike. You are able to choose various individual parts from multiple default mech builds and combine them into an unstoppable force. Trade resources and your own mechs parts in favour of others, or blow them off of another mech and steal them. The choice is yours.